So the experiment proceeds apace in E402, and yesterday went well. I wanted to reassure my students that introducing a conversation of positionality, privilege, and culturally responsive teaching was not meant to start the semester off on a guilty note. Rather, our goal is to help them realize or remember that we all begin our teaching from a particular position that we have developed over time to understand the world. This perspective inevitably shapes our teaching, too, so we’re confronting the issue head-on. My and Antero’s goal is not to say, White people are bad. White middle-class people are really bad. And white, middle-class males are really, really bad. (As I told them, I’m married to a white, middle-class man, and I have a son. I like you guys a lot!) Instead we’re working from the assumptions I mentioned at the end of my last post–that they want to push their thinking and become teachers who will do right by all their students, including those who may not share their cultural identity. BUT we aren’t stopping at the point of raising consciousness; instead, we are using that foundation to inform their development as writing teachers. They are going to learn teaching METHODS of supporting students’ writing development, designing curriculum, and assessing their work. In other words, all this hard conceptual work is inextricably linked to the practical. Danielle Filipiak’s rock-star teaching is helping us figure out what this looks like in the classroom, and we hope the SOS Project will also allow us to accomplish those joint objectives while also having real impact on kids. It’s one way we can do something. I confessed that thinking and teaching like this is HARD WORK that I certainly haven’t figured out entirely because the landscape is always shifting. Yes, we will fail, but we will fail forward. At the end of this post, you’ll find a poem by Bonaro Overstreet that Allan Johnson includes in Power, Privilege, and Difference. I shared it with them in hopes that it will remind us that we can do something beyond steeping in powerlessness and frustration. What does this postcard tell you about your partner’s cultural identity? How do you think your partner’s cultural identity might shape her/his teaching? Because we didn’t have an even number of students, I got to play, too, and at least in my conversation with one of my students, Amber, the exercise was worthwhile. We both got know one another better. I learned that for Amber, school wasn’t a resounding success. In fact, though she is obviously bright and capable (she started out in an IB program), she was a “bad girl,” as she put it. As a result she moved from school to school before eventually landing at the same high school that my own kids have all attended. There she met some English teachers who were straight shooters, and they made a difference for her. (I know one of them, and she is indeed a “warm demander” like the teachers Lisa Delpit describes in the chapter we’d read for that day.) As a result, Amber wants to be a teacher who has a similar influence in her students’ lives. I can’t wait for her to meet the kids at Centennial, the alternative high school where we’ll be working and piloting the SOS curriculum our class develops. 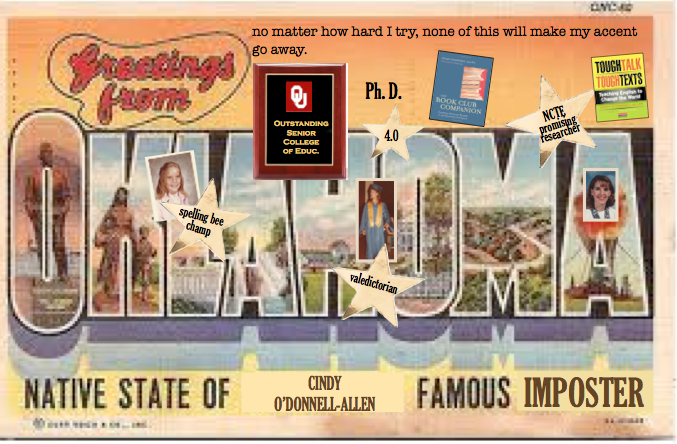 I talked a bit about my own postcard, which I hope illustrates my struggle with my accent as evidence of my Oklahoma background and the assumptions others have sometimes made about my intellect, my political persuasions, and so forth because of where I’m from. Indeed, all Oklahomans are NOT alike in these areas, although we do share some values (at least where I grew up) that I hold dear to this day–a strong work ethic, a general friendliness, strong connections with family and friends. Although things have changed a lot since I left the state in 1999 (and I’ve changed, too), I grew up believing that people ought to take care of one another, and that’s part of who I am, too, as a teacher and a human being. Judging from other students’ postcards and the little bit of eavesdropping I was able to do, I know that they discussed some tough stuff–gender, multiracial identity, family, religion, linguistic background, sexual orientation, politics, and so forth. I’m glad to know them better and proud of them for being brave. Many of them gave me permission to scan their postcards for our class website. I’ll provide the link once I’ve done that. In the meantime, I’ll leave you with the poem I shared with them that I hope conveys that baby steps (like the postcard exchange) are one way of moving forward.